Home > Article	> Is Bilirubin Still Accepted as an Explanation for the Red Blood? I actually heard Barrie give a talk down here in S. NM and he stated both as potential reasons why the blood remained red. Never heard any of the blood was brown. From where does this statement come. This is a good topic for discussion, however it is for the experts. Dr. Kelly Kearse has already expressed his views. Is there any other expert who has anything to say? Scientists are a highly disparate bunch. To say the bilirubin hypothesis is “accepted” or “not accepted” implies that the amorphous entity called “scientists” has at least heard of the Shroud, which I fear it hasn’t. The first mention of bilirubin in connection with the Shroud seems to be in ‘A Chemical Investigation of the Shroud of Turin’, Heller and Adler, 1981. “Characteristic blue azobilirubin colors could be positively detected in reflected light on the surfaces of the olive coloured shards, the orange globs, and, also, weakly on the more orange colored red coated fibrils.” The redder coloured fibrils are specifically excluded from this analysis. Another roughly contemporaneous paper, “The Origin and Nature of Blood on the Turin Shroud”, which I can only find in ‘The Orphaned Manuscript”, goes in more detail into the bilirubin content, based on the microspectrum photometry previously mentioned. “There is an extraordinarily high bilirubin count, almost as high as the methemoglobin.” There is no explanation of how this was derived, and it is not apparent to me, after studying the spectrum as illustrated in the 1980 paper. In further discussion Adler proposes that mixing orange bilirubin with brown methemoglobin would result in the carmine red stains we see on the Shroud today. I disagree. It cannot be made red by mixing it with brown. Sorry Hugh. Adler never said that the bilirubin is what made the blood still red. He explained to me that bilirubin was a hemolytic agent that broke down the cell walls of the red blood cells releasing hemoglobin, which is what caused the blood stains to remain red. I mention this story in my lectures and interviews because it was that conversation with Adler that ultimately tipped me towards accepting the Shroud’s authenticity. I already knew the image was not a painting, scorch or photograph but until Adler and I had that conversation, the reddish color of the blood was a stumbling point for me (and Vern Miller as well). That conversation took place about seven years before I learned of Rogers’ work with Sapponaria, so I now mention both in my lectures. Has anyone ever demonstrated what Adler claimed? Has one experiment ever been attempted? Has anyone seen a picture of an experimental result? Hunches are not evidence. Alan Adler was a noted blood chemist, a member of STURP and he directly examined the blood on the Shroud and performed microchemical analysis on the samples. He published his work in credible scientific journals. His conclusions were anything but hunches. Hi Barrie I understand you are Jewish, but believe in the Shroud’s authenticity? Please correct me if I am wrong. If that is correct, what is your theory for the image creation? BTW I think the TS is real. I just don’t like seeing statements like bilirubin makes blood stay red forever when this has not been shown to be true. I guess it depends on what you define as true. With the exception of Kelly Kearse, who often posts to this blog and is himself an expert in DNA and blood, there is no one in this group of bloggers as qualified as Adler was to draw those conclusions. He was a brilliant blood chemist, knew exactly what he was doing and he studied the actual blood of the Shroud. He was also one of the other Jewish members of the STURP team, so he had no pro-authenticity agenda and was only interested in analyzing the samples using the tests that were available to him and doing good chemistry. In my opinion, he did. “And didn’t Sam Pellicori discover that fibers inside a blood soaked thread were brown while the fibers on the outside were red?” I’ve not come across this before, as far as I know. Where did he get his blood soaked thread from? As far as I know no threads were taken from the shroud in 1978, blood stained or not, so where did this one come from? I now disagree with Adler’s ‘bilirubin hypothesis’. There are many reasons, the first being, as Hugh wrote, that ‘mixing orange bilirubin with brown methemoglobin’ can not be made red or pink. This is an extraordinary interesting paper. We may agree or not with her conclusions, but there are some interesting information about the ‘bilirubin hypothesis’. There is no doubt that the bloodstains are truly bloodstains. Why are those bloodstains too red/pink? It is a problem that has not been resolved today, but the ‘bilirubin hypothesis’ is no more reliable. There are many other hypotheses (Saponaria, post-mortem acid heme-madder lake on madder-and-starch coated Shroud…). Good question Hugh, but perhaps it is a moot point. Pellicori was an optical physicist (an expert in optics and lenses) who actually designed and built one of the instruments we used to examine the Shroud in 1978. In my opinion, his personal observation of a single thread or fiber has no more bearing on the chemical analyses done by Adler than the comments on this blog. My money is still on Adler. What is the consensus on the color of the Sudarium bloodstains (those corresponding to the back of the head, away from the presumed dilution by pulmonary fluid)? The VDH paper emphasizes the point that the (treated) cloth must be considered as a variable when evaluating the bloodstain color. To write that ethnicity amounts to objectivity is not a good idea. Instead of taking Adler’s Bilirubin conclusion for Gospel truth, you should go on google and read what other people determined concerning Bilirubin and blood colour. It’s very explicit and dark. P.S- That some authentic active proponents on this website disagree with Adler speaks volumes. Perhaps it is simply a question of finding a sample of human blood of a similar redness and working from there. So far no forensic expert I have asked has ever seen dried human blood this red. “re Alan Adler’s protocols: it’s easy to be impressed by lists of the tests he did perform to confirm “real” blood, albeit degraded. But one has to be a specialist in the area of tetrapyrroles, whether cyclic, like the porphrins, or linear like the bile pigments, to know that uv.visible and fluorescence spectra alone do not provide proof positive. For two years I was a bile pigment specialist, working on Philadelphia on the phototherapy of neonatal jaundice, and teamed up with a then major drug company (SKF) to use state-of-the-art methodology for identifying bilirubin photo-derivatives. key among those were initial thin layer chromatography, followed by derivitization to form volatile TMS-derivatives, followed by mass-spectometry. We were not content to look just for finger-printing fragments – we regarded detection of the molecular ion as our goal. Barrie is entirely correct to defend Adler as the most qualified and the most experienced scientist to work on the blood of the Shroud, and his (and Joseph Heller’s) account of what they did is extremely useful. However, by his own admission the conclusions he drew from his observations were tentative, and where they appear contradictory anybody is entitled to ask for clarification. Scientists are also allowed to change their minds, and sometimes contradictions in an entire corpus can be explained like that, but again anybody is entitled to ask why. I have been trying to find a copy of The Orphaned Manuscript ever since I first knew of it, without success – perhaps it will appear on shroud.com shortly – and perhaps that will make Adler’s thinking clearer. The Orphaned Manuscript will be published in our next website update in late April or early May, along with the final two issues of Shroud Spectrum International. Pause for thought? It’s needed certainly, if one’s to go on quoting (misquoting?) Alan Adler, correctly or otherwise, as having (allegedly) described bilirubin as a “hemolytic agent”. Bilirubin is an end-product of hemolysis. I have never heard it described previously as a hemolytic agent. Were that the case, then jaundice would be a horrendous condition, subject to positive feedback control (more bilirubin, more hemolysis, more bilirubin, more hemolysis etc etc). It’s time the bilirubin story was given a decent burial. There was simply no solid analytical foundation upon which to implicate bilirubin in the colour of the Shroud blood stains. Bilirubin is unstable to light and oxygen anyway, as Adler himself acknowledged several years later in his conservation paper. 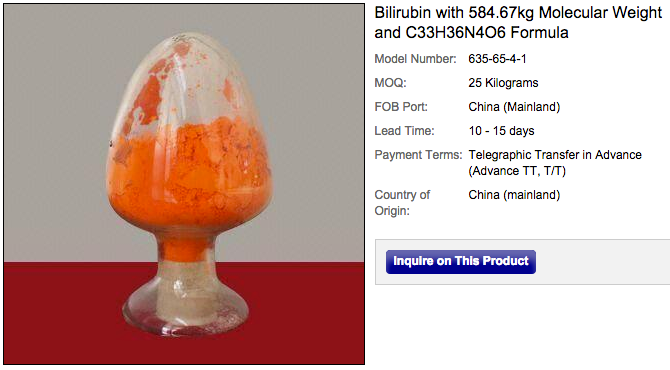 Bilirubin never preserved anything. Biliribin cannot even preserve itself (self-sensitizing its own destruction via generation of the active oxygen species – singlet oxygen). Knowing absolutely nothing whatsoever about the chemistry of blood, I should still think that working on what purport to be ancient bloodstains, badly fragmented, is rather a different matter from working on blood samples recently taken from persons in a modern clinic, whether suffering from neo-natal jaundice or otherwise. During the period 1969-76, a secret commission appointed by Cardinal Pellegrino attempted to analyse the stains on the Shroud. The several scientists included Prof Frache at Modena (forensics & blood), Prof Filogamo at Turin (blood-analysis). At that time the normal tests for blood included: Peroxidase method commonly used to detect hemoglobin; benzidine turns blue, phenolphthaline turns pink; tests unsuccessful; failed to dissolve granules with acetic acid, oxygenated water, glycerin of potassium. Clearly they faced a problem which they were not able to resolve at that time. When their work was put to Adler around 1978, he had at that time had achieved some success with examining blood under UV light and with the resulting fluorescence. The tests that Adler was able to perform seem to have been constrained by the inability to put these ancient stains into solution by the normal methods used when faced with a recent sample. Consequently he seems to have been obliged to carry out such tests as could best be achieved according to his recent research. I have little doubt that Dr Berry is fully knowledgeable about aspects of blood chemistry, including bilirubin. However, the presentations he has submitted here have the disadvantage of showing him to be something of a hostile witness and quite unsympathetic to any prospects of authenticity. That is a pity, as doubtless he is quite knowledgeable about such matters, but for this correspondent, I am unable to grant him the credibility I would prefer to be able to. Very likely he reciprocates this courtesy. Adler had to work with microscopic particles of blood lifted from the Shroud by Rogers’ tape samples. I am sure that was a limitation not encountered by Dr. Carter in his work. Also, we know the samples he tested were at least 700 years old. Adler was extremely cautious about making claims for the blood and even referred to it as “primate” blood rather than human. This was noted again in a recent posting by Kelly Kearse who explained that the more sophisticated tests in use today were not available to Adler in 1978. I think everyone agrees that new testing should be done at some point in the future that could answer these questions more completely. What about Adler ? Was he neutral and objective? This retired scientist (now kitchen laboratory blogger) is certainly no longer neutral re authenticity, and has not been since 1988 and the radiocarbon dating. (Those here who doubt the result should be pressing Turin to agree to a follow-up with sampling from more central regions of the TS, assuming they can tolerate the ‘defilement’ which must also have been a factor in folks’ minds when the corner snip was mistakenly taken and relied upon as a ‘representative’ sample). However, not being neutral does not mean one ceases to be objective in the design and reporting of experiments. Switching between subjective and ob jective modes is the essence of the scientific modus operandi. Not many people (here especially) seem to appreciate that. Science is all about riding two horses, maybe not simultaneously, but certainly consecutively/alternately. and knowing when to switch from one to the other. They would actively lobby for a new radiocarbon dating if they really thought that the shroud was 2000 years old Colin. Don’t hold your breath.PHPL. Who was it who said (on camera) at St.Louis in October last year that a rerun of the radiocarbon dating would be “dangerous?” Collapsing cloth anyone? Dematerialized corpse? Niuff said. And they accuse ME of bias! There has been some misunderstanding when it comes to radiocarbon dating. The Shroud is not an article of faith. Now if you would like to see some convincing arguments about why C14 will not necessarily lead to the truth read Ian Wilson’s “The Shroud. The 2000-year-old mystery solved”. Regarding your query about Dr. Alan Adler, he had no axe to grind and being an erudite scientist he was also objective. He was also the only American on the Commission for the Conservation of the Shroud formed in Turin. I’d be lobbying for a complete second round of non-destructive observation aka STURP 2.0. This is at least something the Vatican may consider. I’m also confident that this time, knowing what to look for specifically, sufficient evidence will be found to prove or disprove authenticity. I agree David. In fact, I believe Turin agrees as well. See the paper by Bruno Barberis, president of the Turin Center for the Study of the Shroud, which was presented at the Valencia Conference in 2012. It was titled Perspectives for the Future Study of the Shroud. Here’s the link: http://www.shroud.com/pdfs/barberisv.pdf. It would require creating a new group of independent researchers, formulating a comprehensive test plan and submitting it to the authorities for review and approval. That’s exactly what STURP did in 1978.